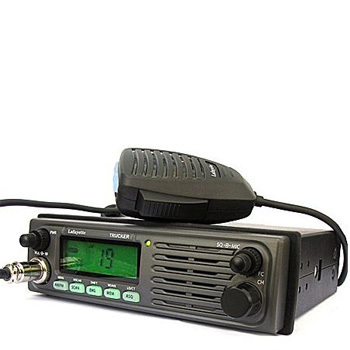 The Lafayette Trucker CB Radio is a DIN sized radio with a front mounted speaker, so is ideal for fitting into a standard stereo sized DIN slot (but can also be mounted on the dash with the included bracket). The Lafayette Trucker has a dual colour LCD display which is either green or orange and can be easily changed in the menu. There are also illuminated buttons on the microphone which is unique to this CB radio. Other features include; Multi channel operation, AM/FM, ASQ button on microphone, Large LCD screen, Memory channels, Dual Frequency and Channel Display, DIM Button, Dual Watch and Channel Scan.